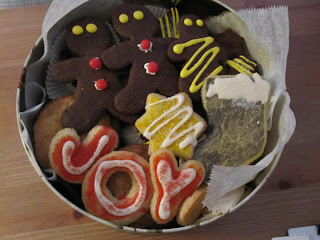 the JOY cookies, stocking and star above are from this recipe. Mix flour, salt, sugar together in bowl of mixer or food processor. Add butter and mix until it's a crumbly consistency. Whisk together yolk, cream and vanilla, then knead into butter/flour mixture. Divide dough in half and roll out each piece between two sheets of wax paper or parchment. Chill on a baking sheet in your fridge, on the porch in December or in the freezer for even a few weeks. Preheat oven to 325 and line baking pans with parchment. Cut desired shapes with cookie cutters, re-rolling and re-chilling scraps. Bake about 12 minutes, until the edges brown ever so slightly. Be careful not to move the cookies too quickly so they don't break. Variation: to add color BEFORE baking mix serious paste food colors with some cream and brush onto cookies BEFORE baking. Alternately sprinkle with colored sugar BEFORE baking. Or wait until after they've cooled and then do a butter icing or royal icing! Raspberry Pecan Rugelach - or my new favorite Jewish Christmas Cookie! So in visiting Zabar's in NYC, in addition to becoming completely addicted to their spectacular $8/pound coffee, I discovered a wonderful little pastry called Rugelach. Getting it shipped from New York to Philly is a bit pricey though, so I decided to try my hand at making it. 1. Mix salt and flour together in food processor big bowl. 2. Add butter and cream cheese, and pulse about 12 times, until it looks a bit sandy / crumbly. 3. whisk together yolk and vanilla. Add to processor and turn on until a soft dough forms. 4. Split dough into four equal balls, wrap each in parchment or wax paper, flatten into a disc about an inch thick and chill at least 20 minutes, or a couple of days. 5. Sprinkle a work surface with powdered sugar. Use more powdered sugar on rolling pin. (don't skimp - the dough itself has no sugar) Take just one piece out and roll into a messy thin circle-like shape. 6. Microwave jam enough to soften, and mix in some powdered sugar. Spread thinly on dough and sprinkle with nuts. 7. Slice dough (using a pizza cutter if you have one) into 16 wedges. Starting from thick end, roll each up and place on parchment lined baking pan. Chill this pan for about twenty minutes (I just put it on my porch in December). 8. Bake for 20-25 minutes until lightly browned. Directions Preheat the oven to 325 degrees F.
Drop the batter onto sheet pans lined with parchment paper using either a 1 3/4-inch diameter ice cream scoop, or 2 teaspoons. Bake for 25 to 30 minutes, until golden brown. A yummy new cookie, I put together with a variation from a rugelach dough! In a food processor quickly blend flour, salt and sugars. (Just use a cup of powdered sugar if you don't have vanilla sugar). Add butter and cream cheese and pulse until crumbly - about 12 pulses. Whisk together egg yolk and flavorings and add, then run food processor until dough forms. Split dough into four pieces, and roll out between parchment paper. Chill (I put mine out on my porch in December). Then cut with round cookie cutters. (I used the mouth of a standard canning jar). Transfer each round to a parchment lined baking pan. Place a small (about 2 tsp) bit of marzipan onto one side of the round, then fold and seal the half moon. I pressed one sliver of almond into the top of each cookie for easy identification as an almond cookie. Bake at 375 for 15-20 minutes, until lightly browned. Immediately sprinkle with powdered sugar and cool completely before transferring to a storage container.